Lease and Loan Calculation for Excel calculates and combines current period payments of principal and interest, provides outstanding balances, months remaining, payments remaining and asset book values under straight line or declined balance depreciation schedules. Starting input information includes the loan/lease principal, interest rate, repayment months, salvage percent and depreciation years. The Lease and Loan Calculation for Excel program calculates the monthly repayment, and at each month end the periodic repayment of principal, interest charges, balance carried forward and book value carried forward. 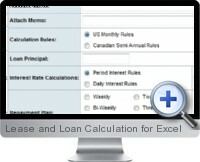 The Excel add-in then consolidates all leases/loans into one overall month end summary report. The Lease and Loan Calculation for Excel organizes multiple accounts using Excel tables that provide quick and easy look up and drill down to any lease/loan account and report of current balances. The program transforms all accounts into yearly principal and interest payments schedules based on daily interest to a maximum 20 year repayment period. The Lease and Loan Calculation for Excel includes lease or loan repayment amortization schedules that accrues interest on the daily balance method for a maximum of up to 7,755 days - over 21 years, with daily accruals of interest based on 360 days, 365 days or 366 days. The Lease and Loan Calculation for Excel package also contains a demo tutorial.